Our Lenten series of Taizé Worship Services of Contemplative Sung Prayer will concludes Wednesday, April 17, at 7 pm in Walker Chapel. Child care is available if reserved by Tuesday at 5 pm. Easter Floral Remembrances are once again available for purchase. Donate $10 toward the purchase of the floral plants to be placed on the Chancel this coming Easter Sunday in memory of loved ones (Note: There is not one plant per remembrance. Donations go toward the overall display.). Forms are available at the front desk, and the deadline to order is Palm Sunday, April 14. A Good Friday Family Workshop will be held April 19, 10 to 11:30 am, on the 2nd Floor. Come for a potluck brunch, child-friendly worship, and an Easter craft with church families and friends. Sign up at the front desk or by email to Bev Bolsen at bbolsen@firstpresevanston.org. Our next New Members Class led by Pastor Ray Hylton will be held on Saturday, May 4, from 9 am to 2 pm for all interested in membership at FPCE. Childcare will be available upon request. For more info or to sign up, please contact Janice at 847-864-1472 or at jdobschuetz@firstpresevanston.org. Please include "New Members Class" in the subject line. A new Adult Education parenting class begins Sunday, April 28. All parents, grandparents and caretakers of infants through high schoolers are invited to join us for this 4-week class on technology and parenting. We will discuss the challenges that technology poses for parents, sharing ideas and techniques for growing technologically responsible, Christ-centered children and youth. The class will be facilitated by Rev. Amanda Golbek and will meet in Room 213. FPCE has reserved space to hold Family Camp at Stronghold Camp & Retreat Center, Oregon, IL, July 5, 6, and 7. Housing options include tent camping or staying in the lodge. Meals are provided. You can learn more about pricing here. If this is something your family might be interested in, please reach out to Pastor Henry at hcoates@firstpresevanston.org. Parents, grandparents, children, and friends are all invited! 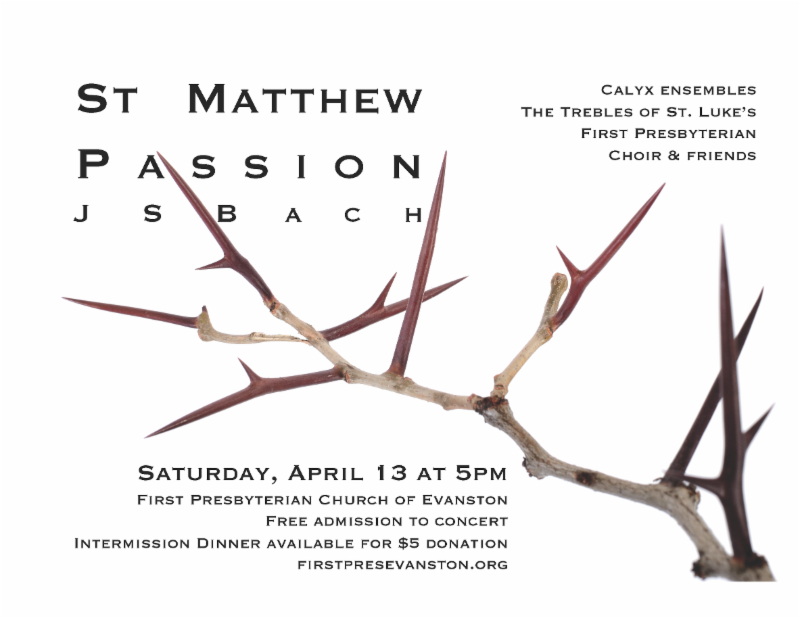 A St. Matthew Passion Concert will be held Saturday, April 13, from 5 to 8:45 pm in the FPCE Sanctuary. The professional Calyx Ensembles, joined by members of the FPCE Chancel Choir, the Trebles of St. Luke’s Episcopal Church, and local church choirs, share J.S. Bach’s epic choral masterpiece recounting and reflecting on the death and burial of Jesus Christ. Sung in German, with projections of the text in English. A chili dinner will be available at intermission for a $5 suggested donation; reserve a dinner ticket by emailing hmcconnell@firstpresevanston.org (there are a limited number of seats at dinner). More information is available here. Potluck brunch, worship, and crafts for the entire family. Join us Saturday, April 27, for our annual Rebuilding Together outreach. Sign up for one or more “shifts” throughout the morning and into the mid-afternoon. 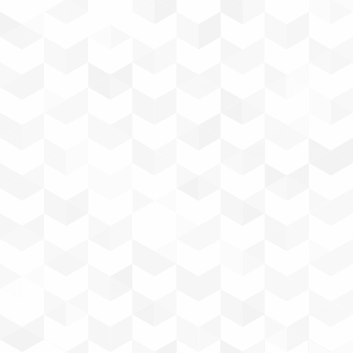 Sign up here (this will take you to an external website). Jobs include setting up in the morning, work crew, lunch preparation, and cleaning up in the afternoon. Please contact Charyl Parry at hughparry@sbcglobal.net or Kris Economos at kriseconomos@yahoo.com with questions.More details to come! Please pray for Nader, General Secretary for the IFES national movement in Palestine, Christian Students in Palestinian Universities (CSPU), and staff colleague with the Palestine Bible Society. Pray for the eight Palestinian “emerging leaders” called to join Nader to serve as staff with CSPU. Pray that God will bless each of these students to find employment so that they can stay in Palestine, and then be able to take part in significant training and educational opportunities. Pray for Nader’s son who is facing developmental challenges, and for Nader’s wife to receive a visa to Jerusalem so that she may resume her job there. May God encourage him and show him grace in this very complicated and challenging Palestinian context. 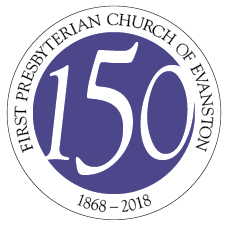 First Presbyterian Church of Evanston is serving as a supporting partner for Next Church, a Presbyterian church plant in Chicago pastored by Michael Miller, a former FPCE staff member. In order to make greater connections with the community there, Next Church is hosting an Easter outreach event. Our church family can help by donating candy-filled plastic Easter eggs. The need is great (they hope to be able to have 10,000 of these eggs for the event). If each member family were to donate two dozen of these candy-filled plastic eggs, we would go a long way towards helping them. Donations are due Monday, April 15, and should be delivered to the front desk. First Kids Choir meets each Thursday afternoon! Children in 4-year-old pre-K through 5th grade meet from 4 to 4:45 pm to sing. From 4:45 to 5:15 pm, children in 2nd through 5th grades ring chimes. Planning for the summer? Remember to add FPCE’s Vacation Bible School to your plans. This year’s session will be held August 5 through 9, 9-11:45 am. Middle School Youth Group (NUBS) meets each Friday, from 7-9 pm, on the top floor in the Middle School lounge. Friday, April 12, we will enjoy snacks, play games, and put together Easter goody bags for the elderly. High School Youth Group (PYGS) meets each Sunday afternoon, from 4-6 pm, in the basement youth lounge. This Sunday, we will enjoy snacks, play games, and talk about Holy Week. High school mission trip participant meeting THIS Sunday, April 14. All mission trip participants will meet in the basement youth lounge at 12:30 pm. All youth are invited to join us for the Good Friday workshop at 10 am. Youth are invited to help lead the craft activity and help with the interactive worship time. Contact Pastor Amanda if you can help. More details about Youth events can be found in our weekly email. Text YOUTHGROUP to 42828 to subscribe! The First Pres 20s/30s small group meets every other Sunday. Our next gathering is this Sunday, April 14. Good food, in-depth conversation, great times! If you’re interested in coming to check it out, reach out to Pastor Henry at hcoates@firstpresevanston.org for details. Thursdays, 4-7 pm, Roy Hall - Open for parents and their children to come run around, shoot some baskets, play some games. No need to RSVP; just show up and have a great time! Due to the Holy Week schedule the monthly women’s basketball pick-up game will take place Thursday, April 25 in Roy Hall at 7:30 pm. These games normally take place on the third Thursday of each month. All skill levels and abilities are welcome! Reach out to Kathy Grant, kgrant@depaul.edu with any questions. The Prison Ministry Saturday Surprises events are in need of drivers to operate the FPCE church bus. No Commercial Driver’s License is needed, but volunteers would need to familiarize themselves on safety procedures and workings of the bus. Test drives are available. Prison Ministry Saturday Surprises, per Matthew 25, attend to children who are the least of these — Angel Tree children and children served through New Life and First Friends ministries. It is also our delight to occasionally take these children someplace special. Our next trip will likely be to Shedd Aquarium. Interested? Contact Sonia Evenstad 847-869-5112 or evenstad@sbcglobal.net. Homework help at New Life! FPCE is now providing homework help/tutoring to the children at the New Life shelter, only 5 minutes from the church. There are currently at least ten school-age kids in the shelter, and ideally we'd like to have one volunteer for each child (as well as volunteers to play with the younger kids). We are there Wednesday and Thursday evenings from 7 to 8 PM. Tuesdays are also possible. Email Tom Alrich at talrich@hotmail.com or Dane Watkins at creativedane@sbcglobal.net . Are you interested in becoming a regular visitor to one of our homebound members? If so, Friends in Christ would love to hear from you! Whether you are an old pro at visiting, or are willing but would like a little training, please step forward and call Bonnie Kath (847-507-4146). There is someone out there who would love a visit from you! We are looking for volunteers once a month to run our projection slides on Sundays at 10 am in the summer, and 9 am and 11:30 am during the school year. Training provided. Contact Neal Ostrovsky at nostrovsky@firstpresevanston.org. The next Book Club meeting will be Tuesday, May 21, from 1:30-3 pm in Room 102. We are reading Educated by Tara Westover. According to Good Reads it is “a universal coming-of-age story that gets to the heart of what an education is and what it offers: the perspective to see one’s life through new eyes and the will to change it.” All are welcome! Contact Parish Nurse Julie Ruchniewicz at jruchniewicz@firstpresevanston.org for more details. Do you need a ride, a meal or someone to run an errand for you? A member of Friends in Christ is ready to help with your need. Please call Bonnie Kath at 847-507-4146. Christ Caring for People through People. 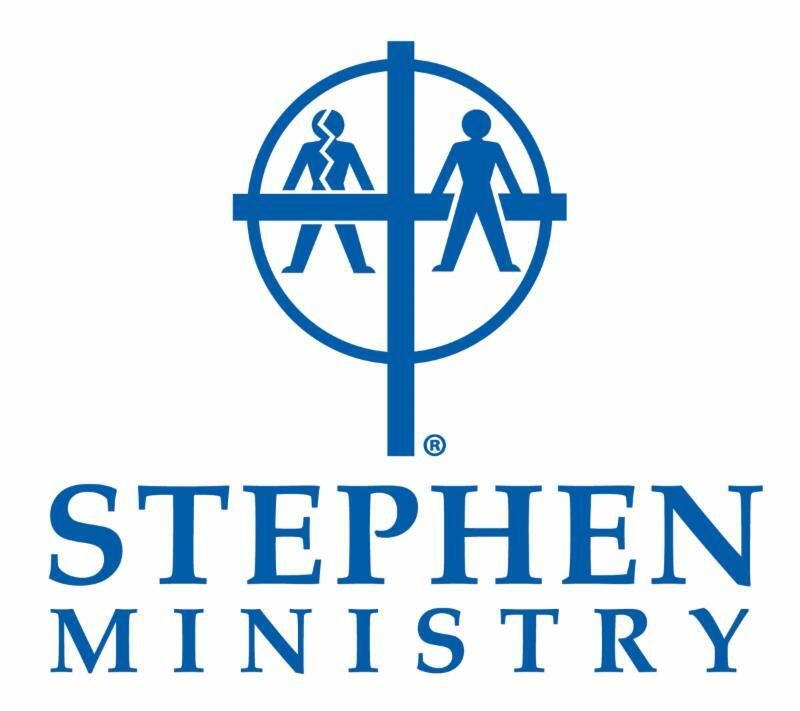 Stephen Ministers are lay people trained to care for someone going through a difficult time by listening, supporting, praying and encouraging. If you could benefit from this confidential ministry call RuthAnn Ostrowski at 312-613-0644 for more details. 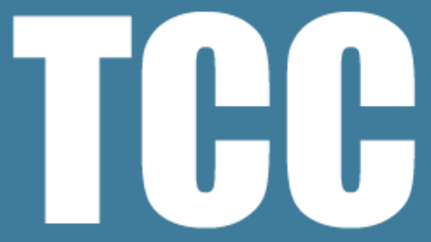 The Counseling Center (TCC) provides professionally trained Christian counseling in our own facility. Contact TCC Director Charles Miyamoto at 847-864-9133. Summary notes from the March Session Meeting are available here . The most recent summary of the Chicago Presbytery Meeting is available here . Paper copies are also available in our literature racks.